Our shelving system was designed and perfected over 50 years ago. Constructed in solid strong pine, all components are finely sanded and have a tough varnish finish. With hundreds of basic sizes, the efficient storage of small items like paperbacks, CDs, videos and DVDs is as easy as that for large storage boxes, files and games. Our shelving has a unique support method. 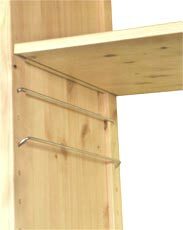 Steel shelf supports fit diagonally into the upright holes and the groove under each shelf. This means that the heavier the load the more stable the shelf. Position shelves where you wish on the uprights. Move a shelf, in 5cm increments, within seconds. Our shelving system is incredibly strong. Our wood is grown in northern Scandinavia, which produces a tight ring growth; we then engineer and finish the shelves, adding further strength. We also use only high quality metal supports, ensuring an unrivalled long-term sturdiness. Caps off the top shelf. Stabilises ad secures shelving - can be used with or without crossbrace / backboard. A single section of 80cm shelving is 83.5cm wide. Two linked 80cm bays are 164cm wide. Just add 0.5cm for each additional upright on a linked run of shelving. To make things even simpler we have developed the Design Wizard. Use it to design a custom shelving unit and have it pick out all the components for you in just a few simple steps.